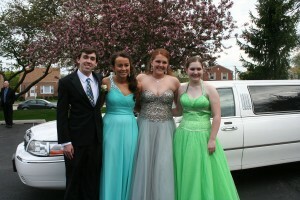 For many teenagers, their prom is the big day they have been waiting for their entire scholastic career. It not only marks the symbolic end of their high school days, but means a transition into adulthood. At Royalty Limousines , we are very experienced in surpassing the expectations of even the most demanding clients. We will ensure that everyone in our care not only enjoys their experience as if it is a fairy tale, but that they arrive to and from their big night safely. We not only provide the most safe and luxurious ride, we have zero tolerance to drugs and alcohol and do participate in the state wide I promise program for safe teens. Hourly split charters are available or point to point transfers, You are Never charged while in the dance! It’s your Special night, Do it right call today and make your prom a Royalty one! ​Need a quote? Give our friendly staff a call. ​​​Because they loved our service, we have proudly serviced many of our prom teens years later on their wedding day!